At Matins, Invit. and Hymn for Lent as in the Ordinary for Passiontide, Antiphons and Psalms as in the Psalter w/Nocturn versicles as there given for Lent. Lessons i-ix p. C278-281). Responses for Lent as given for the Season. No Te Deum. At Lauds & Hours, Psalms of “Lauds 2” are said. Rest as given in the Proper of the Season (C281-282), except Hymn which is from the Ordinary as for Passiontide. The Suffrage (A6) is not said. At Prime the Dominical Preces are said but no Preces at Lauds. At Prime the Athanasian Creed is not said because the Sunday is a Greater and not a Lesser Sunday). At the Hours all as in the Psalter & Ordinary for Passiontide. At Vespers & Compline, Antiphons and Psalms from the Psalter with the Hymn, V/R for Passiontide as given in the Ordinary. Chapter & Collect from Lauds. Ant. on Magn. C282). At Compline the Dominial Preces are said, but no Preces at Vespers. Suffrage is not said. HOLY WEEK: The sic following days are priviliged Ferias, whereon no Feast may have Office. The Annunciation is therefore transferred. Of double Feasts a commemoration is made at Vespers & Lauds only. Excdpt during the Sacred Triduum on wich days not even a commemoration is made. Feasts are either transferred or, if they cannot be transferred, they are simply omitted for this year. At Matins, All as in the Ordinary & Psalter as for Passiontide, ecxept what is given as Proper for the Season (C282-283). At Lauds & the Hours: All as in the Ordinary & Psalter as for Passiontide, ecxept what is given as Proper for the Season (C283-284). NOTE: Lauds has proper antiphons! No Suffrage, but the Preces are said at Lauds the Hours. The APB Collect is the Collect given in the American 1928 BCP. The Latin Rite Collect is the ancient Collect given for this day and is in use outside the USA. Vespers & Compline, Pss. and antiphons as in the Psalter. Chapter, Hymn & V/R from the Ordinary for Passiontide. Ant. on Magn. & Collect from Proper of the Season (C284). No Suffrage, but Preces are said at both Vespers and Compline. Commem. of St. John of Damascus Table 8a. At Matins, All as in the Ordinary & Psalter as for Passiontide, ecxept what is given as Proper for the Season (C284-285). At Lauds & the Hours: All as in the Ordinary & Psalter as for Passiontide, ecxept what is given as Proper for the Season (C285-286). NOTE: Lauds has proper antiphons! No Suffrage, but the Preces are said at Lauds the Hours. Commem. of St. John of Damascus (Table 8b). Vespers & Compline, Pss. and antiphons as in the Psalter. Chapter, Hymn & V/R from the Ordinary for Passiontide. Ant. on Magn. & Collect from Proper of the Season (C286). No Suffrage, but Preces are said at both Vespers and Compline. Commem. of St. John Capistran (Table 9a) & St, John of Damascus (Table 8c). At Matins, All as in the Ordinary & Psalter as for Passiontide, ecxept what is given as Proper for the Season (C286-287). Vespers & Compline, Pss. and antiphons as in the Psalter. Chapter, Hymn & V/R from the Ordinary for Passiontide. Ant. on Magn. & Collect from Proper of the Season (C287). No Suffrage, but Preces are said at both Vespers and Compline. Commem. of St. John Capistran (Table 9c). On the following threee days the Office is taken straight out of the Proper of the Season. It is a very “stripped down” Office (see the “Note on the Sacred Triduum” on p. C288). The Anglican Breviary follows the Pian reform of 1910 in the Sacred Triduum as well, but adds an option to shorten the Office of Tenebrae by indicating where the Psalms would normally be broken up. 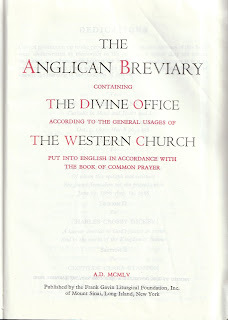 This entry was posted in Anglican Breviary, Book of Common Prayer, Liturgical Year, Ordo, Psalmody, Rubrics. Bookmark the permalink.